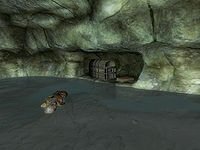 Fallen Rock Cave is a small cave northwest of Skingrad containing undead (quest related). It contains only one zone, Fallen Rock Cave. This cave contains 33 Cairn Bolete plants and 7 Wisp Stalk plants. This cave can be fully explored even if you are not on the related quest. However, the quest-related journal will not appear in the cave until you start the quest. 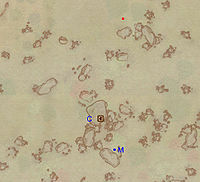 This location's map marker (M on map) is named Fallen Rock Cave (editor name FallenRockCaveMapMarker). The entrance door is NNW of the marker, 60 feet away. 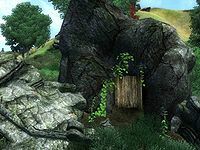 If you enter Fallen Rock Cave during the related quest, your main objective will be Brenus Astis' Journal, conveniently marked with a green quest marker on your map. Outside the quest, the cave is fairly unremarkable and is crawling with undead enemies. Opposite the entrance, falling rocks obviously crushed an unfortunate adventurer long ago and, in the process, blocked the initial path to the north. 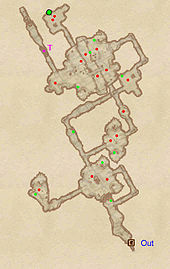 Take the tunnel to your right until you emerge in a large room with two minor loot chests and two enemies. 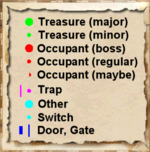 Search the western room for a locked chest then backtrack to the large room. Follow the tunnel leading north and pick the first tunnel to the right. You will face up to three enemies in the first room, so be prepared. Keep following the tunnel counterclockwise and loot the treasure chests along the way. When you arrive on the upper level of the large northern room, fight the many enemies and claim the contents of the two chests. Avoid the tunnel leading to the Cave In trap at T and jump down the pit into a path flooded with shallow water for another chest. If you are on the related quest, heading north will lead you right to your target at Q and yet another chest. Finally, backtrack all the way in a southern direction and exit the cave through door Out.